Most evangelical churches have something in their Statement of Faith to the effect that the Bible is their guide for faith and morals. If a church must have a statement of faith, then this is certainly commendable; though I have never understood why we left off the Apostle’s Creed as our statement. However, just as with individuals in the community who claim to be Christian but live like the heathen, so also a church that does not follow the very Book it claims to exalt is considered to be hypocritical. The apostle Paul gives us the qualifications that we are to look for when considering someone for leadership in the church. Notice that these qualifications are mainly for “overseers,” which in today’s world means ‘pastor.’ This is another area where we have left the Word for the tradition of men as we look mainly at which seminary was attended and whether the person has been ordained. The two passages that must be considered when listing the qualifications are 1 Timothy 3 and Titus 1. Since 1 Timothy comes first, I will begin with that letter as I pull all the requirements together into a list. There is, of course, some overlap between the two. 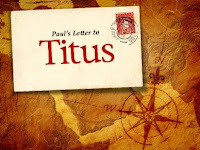 However, there are 23 different qualifications listed for those who would desire to be overseers, but it is my intention to only go over those listed in Titus as we try to discern the qualities of leadership the Lord would have in these last days. The list from Titus begins with "blameless," the same as in Timothy. It is conceivable to take that as the only requirement, because if any of the others were not present, the person would not be blameless. But, I do not think that is what Paul had in mind. However, before any of the outwardly observable characteristics are listed, there is one given to which we do not pay much attention—desire. Much stress is laid upon the idea of the necessity of being “called” to the ministry. Paul says it may reside within the heart of a man to desire such a thing. He then states that this a good thing. I would submit to you that this is the first requirement of church leadership—desire. If a person does not desire to be in a position of oversight, do not try to persuade them. Leave it between them and the Lord. This should hold true for every aspect of your ministry—Sunday School, nursery, children’s church, pastoral oversight, missions, visitation, whatever. Make sure a desire is present. Many have been moved into some position simply because the “need” was great; but there was no desire. School administrators must continually resist the temptation to fill a position with a “warm body,” especially in the area of Special Needs Education. This same temptation is frequent within the realm of the church, because people tend to “burn out” when involved in one particular ministry for too long. For the role of the overseer/pastor, however, desire is essential. It is also the easiest to discover, for desire is usually present, but not necessarily from pure motives, which is addressed later on. The first thing Titus was to notice was whether the candidate was blameless. An overseer must be blameless. Without blame. He cannot be blamed for anything. How far back into one’s past are we allowed to go? Certainly, since ALL have sinned and come short of the glory of God (Rom. 3:23), we will inevitably find blame somewhere in their past. Obviously, then, we are not talking about our current political process in the U.S. where the indiscretions of youthful exuberance can derail an otherwise qualified and mature candidate. We are looking into the current condition of the candidate since becoming a Christian. That is one of the reasons he must not be “a novice,” but one who has matured in their walk with the Lord. Is he blameless in every area of his life? As stated earlier, this could well be the overarching characteristic, with the others listed as ‘checkpoints’ for areas of possible failure. It is from that place that we will begin to consider the remaining qualifications as listed in Titus.